Portugal felt this was a game they couldn't afford to play in an over-cautious manner and therefore, beating Denmark became almost an obligation. Pepe, Postiga and Varela scored the Portuguese goals that helped defeating Denmark by 3-2 and everything will now be decided next Sunday, in the last fixture of Group B, against Holland. Portugal and Denmark clashed this Wednesday afternoon in the Arena Lviv, with the Portuguese side pulling off the 3 points in a late victory by 3-2. In what was seen as a "must-win" game for Paulo Bento's men, the team didn't disappoint an entire nation who was craving goals and managed to reach to a difficult but tasty win. Pepe and Hélder Postiga gave the Portuguese side a two goal cushion lead during the first half, but Nicolas Bendtner would still cut differences before the break. In the second half, the same Bendtner equalized the game with 10 minutes left for the final whistle, after Cristiano Ronaldo missed two great goalscoring chances which would have put Denmark to sleep and assured the 3 points. Nonetheless, Portugal finally showed they have players who can rise to the occasion when the team's biggest star is having a bad day as F.C. 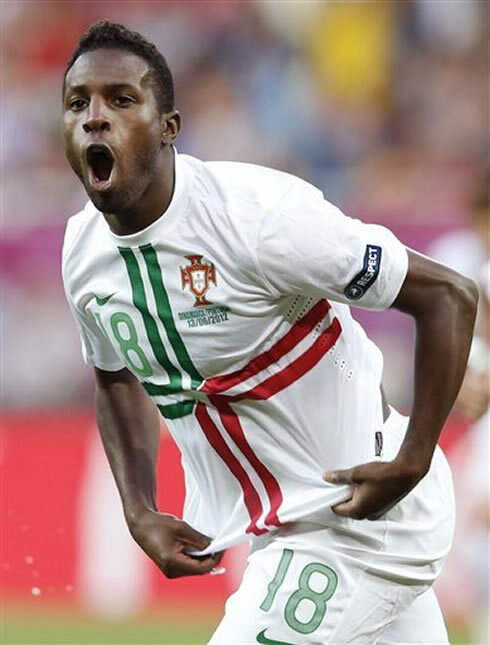 Porto's Silvestre Varela scored the winning goal near the 87 minute, which allowed to restore the European Championship dream. It's a given fact that over the last games Portugal has been struggling immensely to score goals, may that be against stronger or weaker sides. Maybe because of that, we can't say it was exactly surprising that the man breaking that bad habit was actually a defender. With 24 minutes on the clock, João Moutinho took a corner kick on the left attacking side and Real Madrid's defender Pepe, showed up jumping on the 1st post and scoring the opener with a great header that went straight into the back of the net. It's the third goal Pepe scores while wearing the Portuguese National Team jersey and he couldn't pick a better moment than this to show his love for the country and kiss the Portuguese National Team badge on his jersey while celebrating the goal. The 1-goal lead seemed to have allowed the Portuguese team to settle down a bit and start playing with more confidence. Just 12 minutes after Pepe's goal, Denmark conceded another goal and this time it finally came from a forward. The goalscorer was Hélder Postiga, who finished with his right-foot a good assist from Manchester United's winger, Nani. Everything was going perfectly for Portugal, who had just left Denmark with an uphill task of coming back from a 2 goals deficit in an always high demanding European Championship game. However, the Danish side wasn't really interested in waiting for the half-time in order to realign their strategy and initiate efforts to balance the game once again. With roughly 41 minutes in the match, Krohn-Dehli escaped marking to met a cross on the far post, which has to be said that the Portuguese goalkeeper Rui Patrício had the obligation to have intercepted. Krohn-Deli was therefore granted with enough space to head the ball to the other side and waiting for it was the inevitable Nicolas Bendtner. The Danish forward simply had to head the ball into an empty net, making it 1-2 and revitalizing Denmark's hopes for the 2nd half. Many believe that scoring a goal near half-time can completely change the fate of a game. Denmark was probably counting on that, but it was actually Portugal who always seemed to be more close to score after the break. With 4 minutes played in the 2nd half, Cristiano Ronaldo found himself open on the left, with plenty of space to sprint with the ball and face Denmark's goalkeeper in a 1-on-1 situation. However, the Real Madrid forward seemed to have lacked some of that pace he so often shows us game after game and ended up wasting the chance with a poor finish, while still on the edge of area and far from goal. In the 78th minute, an even more unlikely situation took place, especially if we have in mind that it was once again Cristiano Ronaldo who missed it. Nani spotted CR7 open and assisted his teammate for a clear goalscoring opportunity with only the Danish goalkeeper (Andersen) left to beat. Ronaldo didn't show his usual confidence and nose for goal, ended up hesitating and failed to hit the target by a few meters. A goal there would definitely end Denmark's hopes of getting back to the game and Portugal ended paying for that mistake just a couple minutes later. 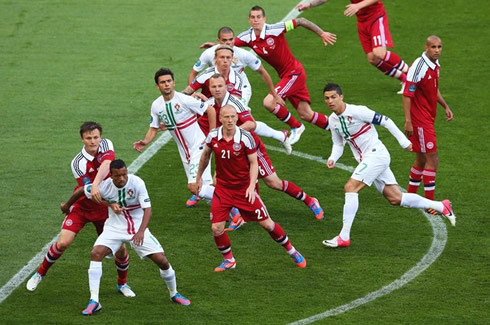 In a very similar play to the way Portugal had already conceded a goal against Germany, Denmark managed to explore a lack of concentration in the Portuguese defense and equalized the game, with 10 minutes left on the clock for the end of the match. Krohn-Deli took a cross that felt into Pepe's unguarded back, which was intended to meet Sunderland's forward, Nicolas Bendtner. The Danish forward then ceased that opportunity to score from a powerful header, getting a brace on this game and putting Denmark levelled at 2 with Portugal. All fears had just become true and Portugal desperately needed to find a way to score a third goal in the remaining minutes of the game, in order to keep alive their dream of going further in the EURO 2012. Fortunately, it all ended well and in a necessarily dramatic way. With roughly 87 minutes on the clock, Fábio Coentrão crossed the ball from the left wing and it was F.C. Porto player, Silvestre Varela, who first missed an attempt to shoot the ball with his left foot, but then immediatly readjusted his stance and fired it into the back of the net. Portugal had just restored that precious lead and would hang on to that advantage until the final whistle, by assuring the vital 3 points at stake. 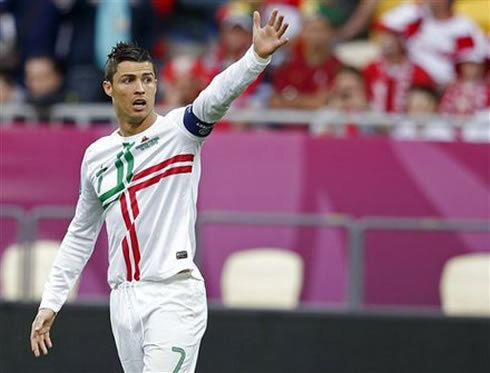 The Portuguese team will now go to the final Group B round/fixture against the Netherlands, with good hopes of booking a presence in the EURO 2012 quarter finals. Real Madrid's season is now over and there are no games left in their schedule until the pre-seasons starts by July. 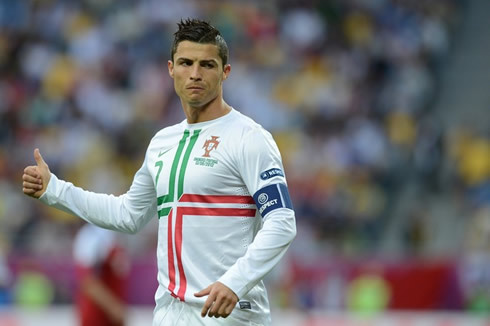 Cristiano Ronaldo is now with the Portuguese Team, in the EURO 2012, and the next game will be against Holland, next Sunday (June 17). In the meanwhile, you can watch Ukraine vs France, Spain vs Ireland, Thunder vs Heat and Italy vs Croatia, all from our sports live streams section. 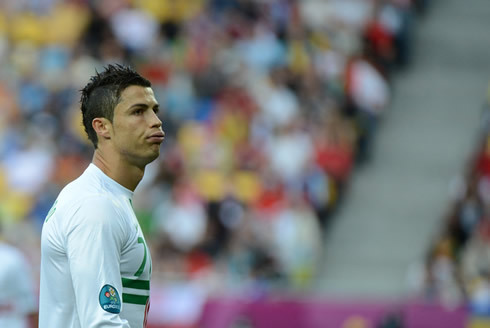 Cristiano Ronaldo will certainly be on the line-up, when Portugal plays against the Netherlands for the EURO 2012.